Seeding, Weeding, Feeding & De-Thatching Lawns | Gardens Alive! Q. 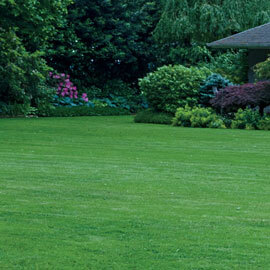 Over the years, I've watched my lawn deteriorate, despite using professional lawn care. Only about 70% is now in good shape, and it is completely barren on a berm near some trees. The lawn-cutting guy does not remove the grass clippings, which act as a mulch. Should I aerate, de-thatch and reseed? Any advice would be appreciated. Thanks. A. Thank you, Avi; I get lots of emails from people who think their lawn looks bad because they don't have a lawn care service pouring on the chemicals. But I get just as many (actually more) from folks like you, with a 'professional' service and lousy looking turf. 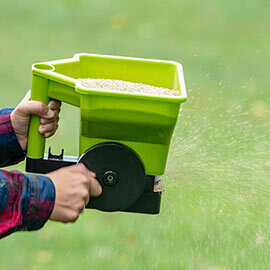 The Big Truth is that most lawn care companies have a short season in which to make a year's worth of income, and so often pile on products and services that may not be necessary or correctly timed. And it seems like they all cut the grass too short, because that's how you get it look like it needs re-cutting the fastest. So, let's review the real, non-toxic needs of Spring lawns across the country. People with cold winters tend to grow cool-season lawns; typically bluegrass in sunny spots and fescue in shade. These grasses thrive in cool weather, go dormant at the peak of summer and may not survive a really hot climate. Cool season grasses growing in sun should be cut at a height of three inches; in shade, at least an inch and a half higher. People with warmer winters grow warm-season grasses, like Bermuda in sun and St. Augustine in shade. These grasses love the heat, but go dormant—or just plain die—in freezing cold. These grasses can take a lower cut, although grass in shade should always be higher than grass in sun. People in the Transition Zone—a gigantic swath that covers the entire center of the Eastern half of the country (and then some)—have hot summers and cold winters, and are therefore doomed. The second thing cool-seasoners need to do is not seed, reseed, over seed, or any other seed in Spring. Fall is the only time to sow seed for a cool-season lawn. (You can lay sod safely in Spring, but its much more expensive than seed.) Fall is also when you should aerate a cool-season turf that heavy foot traffic has compacted, and do any de-thatching. Thatch (browned-out grass parts on the surface of the lawn) is caused by overfeeding with chemicals, NOT, by mulching clippings back into the turf. Which brings us to Avi's troubling statement about grass clippings as a mulch on his lawn. Lawns don't get mulched, and visible clippings would smother grass, not protect it. But ' mulching mowers', which have sealed decks that cut and recut grass blades until they fall back to the earth as a virtually invisible powder, are great. Returning that high-nitrogen powder to the soil provides half the food your lawn needs in a given year. Areas, that are elevated above the rest of the lawn—like Avi's barren 'berm'—dry out fast and are difficult to keep grassed. If possible, level out that uprising and plant sod on it now or seed it in mid to late August. If the raised area can't be altered, sod it now and keep it watered until the sod establishes. Then keep it watered, period! Raised areas always need more water than the rest of a lawn; a soaker hose dripping slowly at the apex would be ideal; anything that delivers a lot of water fast would be bad. If the area is shady, you'll have to overseed every couple of Falls no matter what; grasses that thrive in shade can't spread to repair damage like sun-loving grasses. Q. Mike; I quote from your Fall lawn advice: "The care of warm season grasses like zoysia that turn tannish-brown and go dormant for the winter in the North is very different than that of cool season grasses." So what do I do for my mostly zoysia lawn? And when? And what about the bare spots where it won't grow in the shade? Thanks!! A. Normally I hate being quoted; it means those people are paying close attention, and I depend heavily on the other kind. But in this case it's fine, as your lawn's time is here! You're growing the most common warm-season grass in the transition zone (which your suburb of Washington, D.C. pretty much defines). Wait until it greens up from its winter dormancy, then begin a series of three feedings spaced equally apart while the grass is green. The usual recommendation for warm-season lawns is to use about a pound of nitrogen per thousand square feet of turf each time, but zoysia builds up thatch much easier than other grasses, so only use half that much. Corn gluten meal would be perfect for any of the feedings (5 to 10 pounds per thousand square feet); otherwise use a gentle organic fertilizer labeled for use on lawns (meaning it provides mostly nitrogen) at half the recommended strength. The further South you go, the more food a warm-season turf needs—up to five summer feedings in the deep South. And you want to make that a full pound of nitrogen per thousand square feet every time for warm season grasses other than zoysia. All warm-season grasses should be established now; in Spring to early Summer. You can seed Bermuda grass, but most of the others have to be planted with sod, sprigs or plugs. Spring is also the time to do any necessary de-thatching or core aeration on warm-season turf. Now, that zoysia should grow pretty well in shade; get a fresh supply of sprigs or plugs and plant them thickly in the bare spots. Keep them watered, but don't drown them, as plants in shade use much less water than plants in sun. Iowa State University lawn care expert Professor Nick Christians also suggests letting the zoysia get taller—say three inches—in those shady areas. Dr. Nick recommends that ANY grass in shade be cut as high as possible, so there's more solar collector to keep the roots alive. Otherwise, warm-season grasses take a shorter cut than cool-season turfs; for warm-season turf in sun, keep the height at two inches.